one perspective changes everything. you have an interesting perspective which is no doubt filled with knowledge. so why didnt your subject title say "Lucifer is the flesh and material" instead of "Jesus is Lucifer"? you've done well with the symbolism. but God is the Spirit and immaterial. Lucifer is the 'false light', the flesh, the material world, solid matter etc, a product of the spirit. forged when God said.. 'Let there be Light' and let's not forget that light was initiated at first by a 'Sound'. The carpenter was the stone mason. He was the stone the builders rejected. 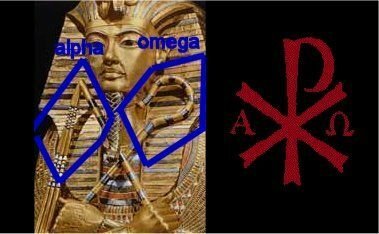 The alpha and omega = the first and the last pharaoh. The first pharaoh wasn't narmer/nimrod/enmerkar. The first pharaoh was Enki, also known as Ea. Jesus = Enki or Ea. Two additional points for your curiosity and confusion. 1) Saturn was worshiped as the Sun in antiquity and this is related through historical documents. Saturn is "Lead" in Alchemic terminology, and is "transmuted" into other stages or variations of itself (other 'aspects of the deity'). The ultimate goal would be "Gold" or the "Sun", which is 'Jesus the Son'. Hermes is the messenger/traveler, the act of transition itself. Mercury is "Red" and "Quicksilver" (the intermediary). Since Saturn = Pan = All than it follows that all energy/matter goes through this "metamorphosis" in varying degrees. (As God = Alpha and Omega, it is clear that Saturn is/becomes the Sun, and that Death/Life both begin/end the cycle as it is circular in nature- Oroboros). Everything including ourselves is the "Lead" and change transmutes it into "Gold" and then recycles through "Death" then "Rebirth" etc. Serpent also means "Crawl, Creep, Crept"
Old English creopan "to creep"
The ultimate 'Creepy Crawly' apparently is "God", which is everything and each of us. Those "Little earth dwellers with the dunce caps"?? They are the Unicorns but don't Gnome? "Selene moon goddess, from Greek selene "moon," related to selas "light, brightness, flame," from PIE root *swel- "to burn" (cf. Sanskrit svargah "heaven," Lithuanian svilti "to singe," Old English swelan "to be burnt up," Middle Low German swelan "to smolder"); related to swelter, sultry. c.1400, frequentative of swelten "be faint (especially with heat), " late 14c., from Old English sweltan "to die," from Proto-Germanic *swel- (cf. Old Saxon sweltan "to die," Old Norse svelta "to put to death, starve," Gothic sviltan "to die"), originally "to burn slowly," hence "to be overcome with heat or fever;" also the source of Old English swelan "to burn," from PIE root *swel- "to shine, burn" (see Selene). For specialization of words meaning "to die," cf. starve. So this apparently means Selene has a direct equation with Shining, Burning, Flame, Death, etc. The S-mother, Selene the Serpent? The Egyptian name, Kemet, means "black country," possibly in reference to the rich delta soil. The Arabic is Misr, which is derived from Mizraim, the name of a son of Biblical Ham. mid-14c., camelion, from Old French caméléon, from Latin chamaeleon, from Greek khamaileon "the chameleon," from khamai "on the ground" (also "dwarf"), akin to chthon "earth" (see chthonic) + leon "lion" (see lion). Perhaps the large head-crest on some species was thought to resemble a lion's mane. The classical -h- was restored in English early 18c. Figurative sense of "variable person" is 1580s. It formerly was supposed to live on air (cf. "Hamlet" III.ii.98). Camel the Cig company put a HIDDEN LION on the CAMEL? The Chameleon??? Egypt and the Pyramids is the theme of the cig's iconography. 3 Palm Trees and the Pyramids are on opposite sides with opposite sizes. Iridescent Shapeshifting "Flemish Lion" = "Chemish Lyin"
Woah....That is a lot of information. I have read most of it previously but see a lot that I haven't seen in my studies. S&F for compiling this, I'll have to read it later, I got things to do right now. Without form.. "formless".. sound familiar? one of my favorites is the Jacob and Esau video. The guy rants, but most "madmen" usually do. Its like being in a room full of people with a candle, while you have a searchlight. And all those with candles "know the way"
Impossible due to law of physics. God created Light and Dark. Light is light, and dark is dark. There is no false dark or false light. God made Jesus the Light, and Satan the Dark. Therefore since "LUCIFER" means "LIGHT BEARER" in LATIN, it's only logical to place this TERM on the JESUS side of the Equation opposing "SATAN". Hopefully this translation should make sense. Thanks for asking though and if you have any more questions pertaining to my comments please ask and I will try my best to resolve any confusion or misunderstanding we may have. I appreciate your contribution and reminding me to address this specifically.